Dunlins in winter are two-tone blahs: nondescript dark on top, white below. But when spring arrives, Dunlins assume an altogether different guise. Their back feathers become a fiery symphony of burnt orange, glowing rust, and ashy black. Dark chevrons of brown march up and down their white breasts. 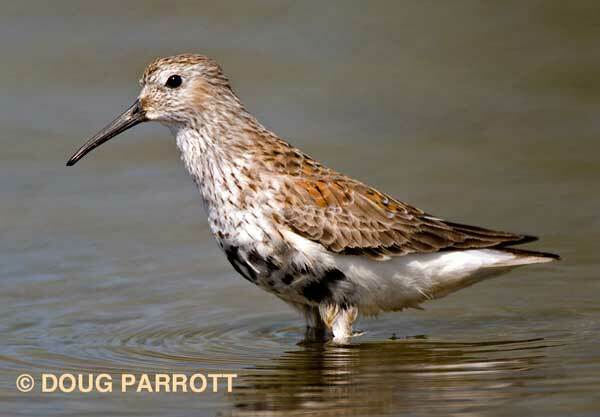 Most stunning of all, Dunlins sport a giant black bulls-eye on their snow-white bellies. Most of the spring Dunlins who come through the Fill this time of year are in the middle of “the change,” like this one that was here last week. Yesterday, though, a fully bright Dunlin appeared on Main Pond, glowing in the weak sunlight of a typical Seattle April. The bird was foraging at the pond’s edge, minding its own business, when a crow flew in and began to chase it. The Dunlin flew away but returned when the crow had gone. Unfortunately, the crow saw it reappear and went after it again. This happened over and over. At last, the Dunlin managed to sneak back to its feeding area unobserved. As it stood there on the shore, panting, it looked over at me. It seemed bewildered by the numerous attacks. The Dunlin gave a little peep and went back to feeding, happy again. This entry was posted in Uncategorized on April 18, 2012 by constancesidles.